a fantastic, easy-to-navigate health resource. great source for Sports Injury info. 30 West 57th St., 6th Fl. the "original" is great for home, and the "travel stick" fits nicely into your suitcase. Founded in 1916, Swedish Institute has the oldest Massage Therapy Program in the country. details how to use Gua Sha in any caregiving practice. 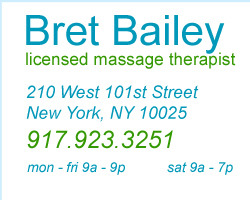 "Bret has a magic, gentle, yet firm touch that is at the same time very relaxing and highly therapeutic. I have trouble with tension in my shoulders and lower back, and I always feel that my aches are gone after a session with him."